Technical Analysis involves the scrutiny of data, in a methodology that is both unique and universally applicable to all markets. In the context of gathering and recording price data, it can be observed that in the behaviour of traded market prices identifiable patterns tend to occur as trends in prices develop. Some market historians suggest that Technical Analysis takes its roots as far back as Babylonian times alluding to the inscriptions on ancient tablets and this may be so, but the more parochially immediate and more widely documented beginnings are thought to be in the rice markets of 16th century Japan. Munehisa Homma is considered the father of Japanese technical analysis and his writings during the late 1700s have strong connections to those of the American/Western equivalent Charles H Dow, although they were separated by over a century. In the late 19th century Charles Dow (as editor in chief of the Wall Street Journal) began publishing the data for the Dow Jones Industrial Average and laid the groundwork for the more modern form of Technical Analysis and triggered its evolution into a scientific and mathematical modus operandi which continues to grow and expand. Technical Analysis has evolved from the basic compilation of data to now include sophisticated mathematical models, including the quantitative approach and hypothesis testing; behavioural science and psychology. One of its main tenets is its reliance on the market dynamic between supply and demand, using this relationship to gauge the mood of the market, as to whether it is bullish or bearish. In the transcription of this relationship patterns and trends develop in the price data which have been proven over time to be cogent guides to a likely future direction. The further manipulation and analysis of the data provides indicators which help determine the conditions affecting the price and aids the fine tuning of the analysis which can then be applied to all the market instruments from equity, commodity, currency and derivatives including the many products for leveraging. 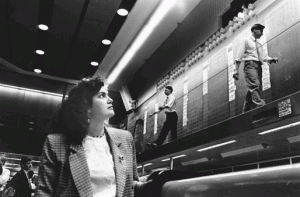 Technical Analysis can also provide a robust link between these markets in what is known as inter-market analysis that allows the analyst to examine, compare and relate the individual constituent products within, and to their market as a whole, as well as to anticipate the overall performance of the market itself and then to compare markets. The above has not been without its controversy and there has been constant debate and comparison, particularly through the last half of the 20th century, between Fundamental and Technical Analysis and to the merit of each approach. The Fundamental method for its part concentrates on the intrinsic value while the Technical focuses more on the dynamics of price, volume and the psychology behind these. It is perhaps important here to single out one of the above branches where Technical Analysis has a distinct advantage over the strictly statistical fundamentals, and that is in its ability to gauge emotion. All market participants are driven by fear, greed, hope and ego and therefore markets constitute a heightened and oscillating emotional state. The markets are quite literally crowds of people interacting and making decisions in an auction that is driven largely by a “herd” mentality. If the crowd becomes irrational it can result in increased and extreme volatility from this unpredictable impulsiveness. As befitting a monitor of constantly evolving and changing markets, Technical Analysis has a chameleon quality and versatile personality, imbuing the analyst with the ability to observe and scrutinize the markets in an inimitable manner. This scrutiny involves the interpretation of the buying and selling power involved in the auction process, and how the market participants are reacting to any given situation at any given time. And in the technical analysts’ tool box there are a broad range of indicators to help monitor this process. As technology makes the world smaller, it only enhances and expands the scope and applicability of Technical Analysis going forward. Through the support of collegial associations such as the International Federation of Technical Analysts, new theories and methods are being developed and tested ensuring the growth in utilization, credibility and the continued effectiveness of Technical Analysis. Edwards, R D & J Magee, Technical Analysis of Stock Trends, John Magee Inc, Boston MA, 1966. Lo, AW & J Hasanhodzic, The Evolution of Technical Analysis, John Wiley & Sons, New Jersey, 2010.